After fracturing my elbow, the olecranon, whilst waiting to be screwed back together, I read everything I could find to help fracture healing. One of the easiest things to do is ensure you are eating the right foods to help your body. To be clear, first step in promoting fracture healing, is to make sure you are eating enough to deal with the increased energy demands of fracture healing. If you’re body is deprived of calories, the speed, and possibly efficiency of fracture healing will be reduced. Poor nutrition increases the chance of non-union, the fracture ends not fusing together. We are all aware that our bones need calcium. Our bones are comprised of 70% minerals, in addition to calcium, minerals such a phosphorus, magnesium etc. Given these are the basic building blocks of bone, repairing a fracture requires the availability of these building blocks to be used in the repair. Quite importantly, if there are insufficient minerals, particularly calcium, they will be drawn from other sources within the body, possibly to negative effect. Simply adding in these extra steps will slow healing, and potentially cause problems for the tissue giving up with minerals. Milk is also a good source of protein, coming in at between 3-9grams of protein per 100ml. Classically it would held you could absorb about ~30grams of protein per meal. In addition to that, the recommended intake for a normal individuals is 40gram for a woman, 60grams for a man. 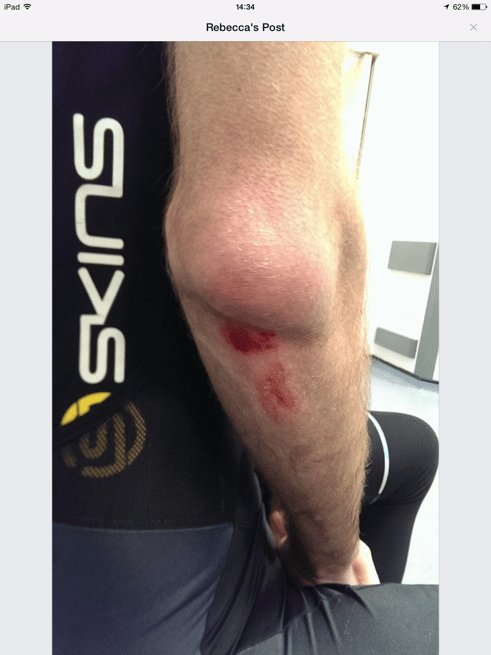 By comparison, male endurance athletes should be aiming for 80-120grams of protein a day, in order to aid muscle repair, personally I’d consider this to be a similar drain on a bodies resources as fracture healing. Thus whilst in the first 4-6 weeks of fracture healing, I have aimed to consume in the 80gram range of protein per day. Some people have suggested that opting for rapid absorption protein shakes would allow for easily attaining that amount of protein during the day. However these can be expensive. 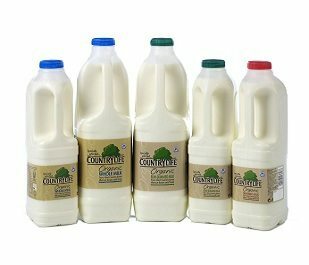 DCRainmaker, one of the most authoritative figures in sports gadget blogging, has two interesting articles on basically milk vs expensive recovery drinks, showing milk to be equally effective. In the above diagram, as the fracture healing progresses, a callus forms around the fracture site, which hardens, before eventually becoming remodelled. That callus is very important in providing a structure and scaffold for the new bone to develop from, but also for the new blood vessels to grow in. If a person doesn’t have enough protein in their diet, rather than becoming and effective, hardened callus, the callus remains soft and rubbery. Fruit and veg – antioxidants! We all know that fruit and veg is good for us. When know that they help keep us healthy, but how does this work with regard to fractures? When a fracture occurs, the force of the bone breaking, and the resultant tissue damage quickly stimulates a massive inflammatory reaction. The inflammation occurs both as a side effect of exposure of the broken tissue components, but also as a method of proction – as the body acts to try and immobilise the fracture itself. As part of tissue damage, the inflammation produces large quantities of free radicals due to the exposure of the raw bone fragment, and damaged tissue to the oxygen to blood. A little like a cut apple being left in the air, it goes brown – this is an example of oxidation, with the production of free radicals. So the bone is broken, free radicals are produced as a result of the fracture. But so what? Free radicals are a little like the smoke that comes from a fire. They are a by-product of the fire, but like smoke, they can also cause a lot of damage themselves. Your body has systems in place that deal with or mop up the normal free radicals, molecules produced as a by-product of being living organism. However these systems can be easily overloaded. The problem with free radicals is they damage the DNA within cells, this can lead to a cell not being able to function properly, which can potentially cause a raft of other health issues. 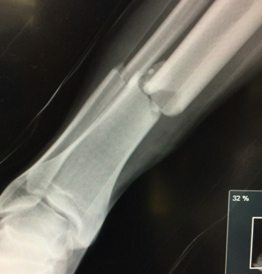 In the case of a fracture, the presence of free radicals means damage to the cells being recruited to the fracture site to start the healing process. Damage to these cells means the fracture takes longer to heal as the body is having the regenerate the damaged cells, as well as the all of the tissue associated with then fractured bone. There has been no evidence to suggest, in the long term, there is any health benefit to taking multi-vitamin tablets. But there is a lots of evidence supporting eating vitamin rich foods is beneficial. We don’t know why this might be yet, as the vitamin C in an apple is the same, chemically speaking as in a tablet. There is evidence to suggest that eating anti-oxidant rich foods is beneficial to moping up these free radicals, and in doing so, improves the speed of fracture healing. For myself, there is isn’t any evidence is suggest multi-vitamins are bad, so I have opted to take a vitamin pill every morning. In addition to a multi-vitamin, I also ensure that I go beyond my 5 Fruit and Veg a day. 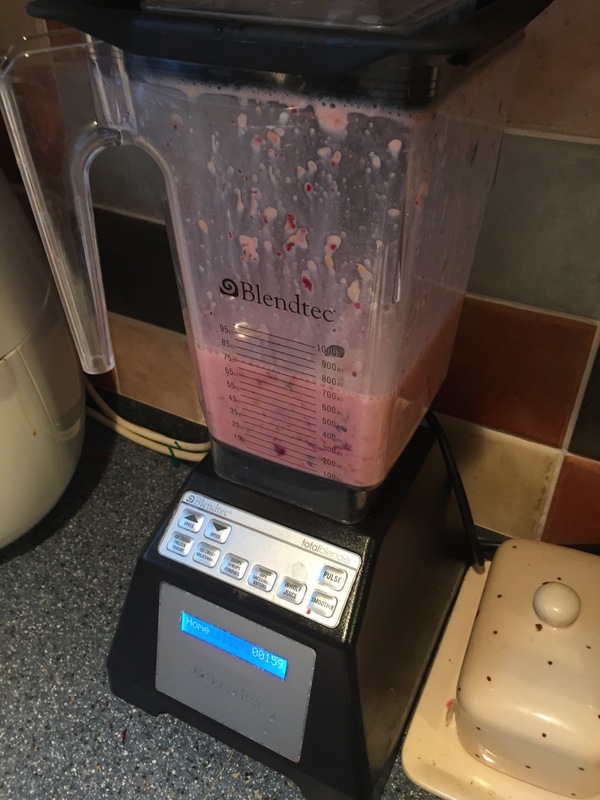 I have been starting the morning by making a 6 fruit smoothie. I also add a few additional ingredients. 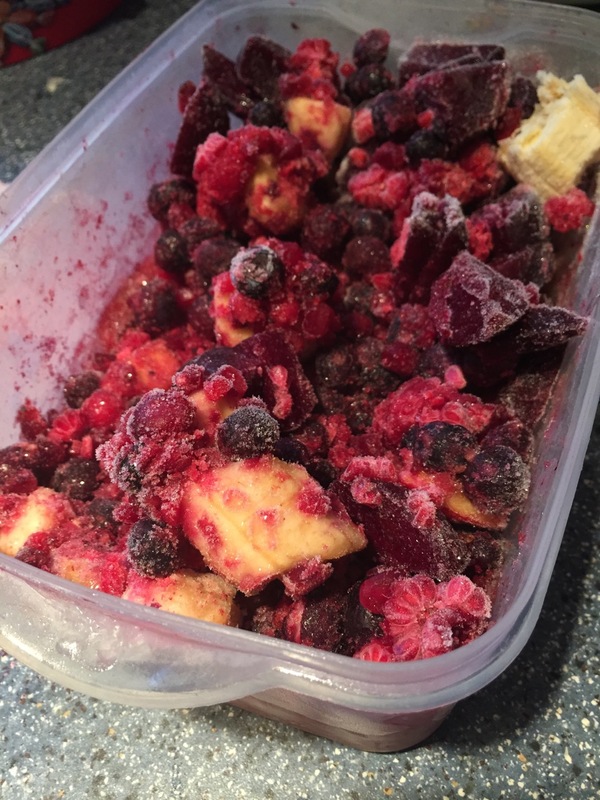 Frozen fruits – Here I have purchased frozen mixed berries, banana’s, Kiwi, mango, pineapple and blueberries. By having everything sliced and frozen I can just shovel things straight into the blender. A good helping and yoghurt for extra calcium, and a serving of protein shake. The apply blender! 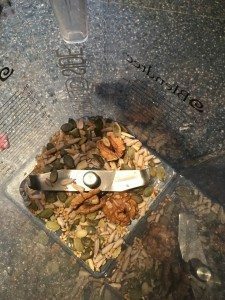 About a year ago, I purchased a BlendTec blender. Largely because I blend about one blender a year, even a Vitamix Blender I had only lasted 3 years. So with an 8 year warranty, I thought I’d be safe from having to buy another for a little while yet. I used kiwis as weight for weight they contain more vitamin C than any other fruit. An orange has about 80mg, whilst the little kiwi has 70mg. I put a whole kiwi in the blender, as the skin gets completely destroyed, like the seeds by the BlendTec. Plus it gives me a little more fibre! However if the idea of blending a whole kiwi doesn’t suit the area simple ways to skin them! Prudential RideLondon 2016 Race Preparations!